The contract of 1541 is preserved with the record of another agreement made within the two years 1 October 1548 and 30 September 1550 with Philibert De Lorme, who had become “architecte dudit Seigneur [Henry II]” on 3 April 1548.2 De Lorme was to visit presumably to inspect, “les ouvrages de maçonnerie et taille de l’édiffice, fait de neuf audit Fontainebleau, auquel il y a deux chappelles, l’une basse e l’autre haulte, et aussy le grand escallier fait de neuf audit chasteau par maistre Gilles le Breton, maistre des oeuvres de maçonnerie du Roy, assavoir si ledit édiffice desdites deux chappelles et ledit grand escalier ont esté et sont bien deuement faits et parfaits ainsy que ledit Breton est tenu et obligé faire par deux devis et marchez de ce faits.” It is from this document that one can assume that the references to a chapel in the contracts of 1531 and 1541 were to the building of it. In 1967 Chastel, noting how different the stairway and portico – the “grand escallier” – in the Cour Ovale were from Le Breton’s usual work, attributed their design to Rosso (see A.2). Breton would have served as the master mason to execute Rosso’s design subsequent to the contract to the mason of 5 August 1531. After 10 March 1541 the external staircase was dismantled and replaced with one inside. The work by Le Breton was inspected by De Lorme in the late 1540s. But all the way along, beginning in 1531, the stairway was mentioned in the same context with the chapel that was built almost directly across from it and also facing the Cour Ovale. Palustre, I, 1879, 98, recognized the close similarity between the portico of this stairway and the apse of the chapel. Following Palustre, Gebelin, 1927, 98, went on to say that “in the two buildings, there is the same superposition of two orders, each crowned by a projecting entablature, the lower level formed of large square piers, the upper of engaged columns. In both one recognized the same awkwardnesses: at the lower level of the apse the arched bays open at the back of large square openings, that are separated by meager buttresses; an awkward disposition that is found in the central opening of the portico, at ground level.” Gebelin believed these “twin constructions” reveal a complete renewal of Gilles Le Breton’s inspirations under the direct influence of the antique. But he did not know how this came about. Bray, n.d. , 5, recognized the Italianate character of the vault with coffers and of the order used on the walls. Dan in 1642 stated that the Chapel of Saint Saturnin was founded by Louis VII in 1169, and in 1259 was dedicated and consecrated by Saint Thomas of Canterbury under the invocation of the Virgin and Saint Saturnin.6 But Dan also pointed out that the entire chapel was entirely rebuilt by Francis I on the site of the original chapel or nearby. Castellan in 1840 believed that the old Chapel of Saint Saturnin, entered directly from the courtyard, was kept and became the foundation of the Chapelle Haute; Gebelin believed it was re-made.7 Bray, 1935, 180, 200-201, thought that the old chapel of Saint Saturnin was certainly elsewhere and outside the precinct of the château, as it is not mentioned in the specifications of 1528 where the relevant old parts of the château are always named, and because in its foundation charter it is called the “église à Fontainebleau” and not the chapel of the château. Thus the lower chapel of Saint Saturnin was most likely an entirely new structure entered from the courtyard. 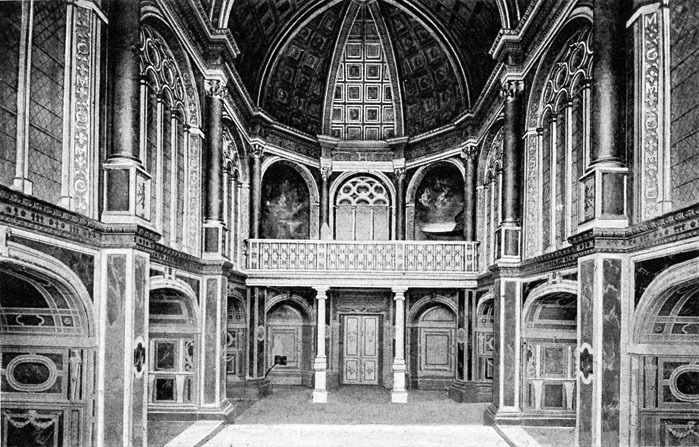 From the Cour Ovale, the upper chapel was on the same level as the Small Gallery to its right and could probably be entered from that gallery as now one has access to it directly from the Salle de Bal (Fig.Dimier, Plan under Francis I).8 In this manner the king could enter it approaching from his apartment. 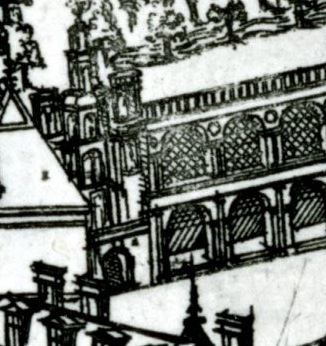 It may be that access at this level accounts for the addition of the Chapelle Haute to a plan that originally called only for a chapel at ground level contracted for on 5 August 1531 (see A.2). 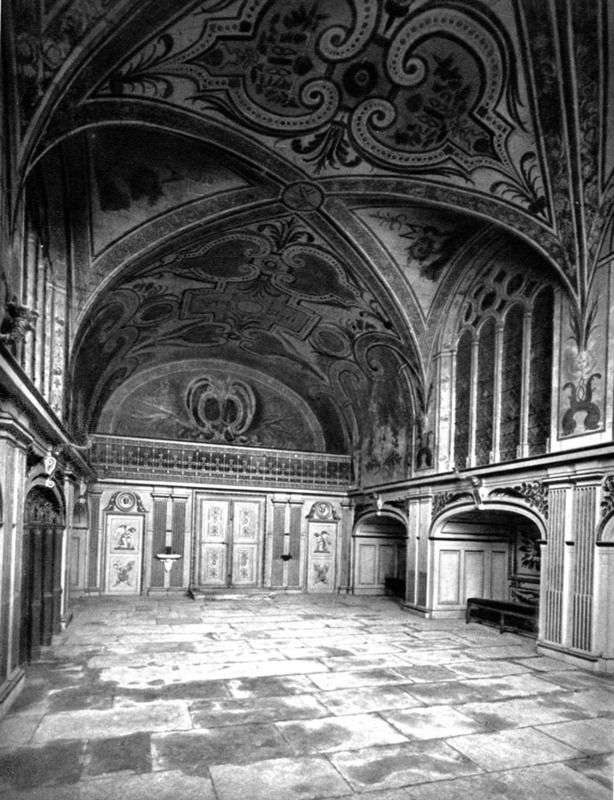 It is also possible that the Chapelle Haute is a substitution for the chapel planned in 1528 for the east end of the gallery that became the Gallery of Francis I, a chapel that was then eliminated from this gallery (see P.22 and A.1). That chapel would have been adjacent to the king’s mother’s apartment, but would almost certainly have been his chapel. Only upon the death of Louise of Savoy (22 September 1531) was the apartment taken by the king. 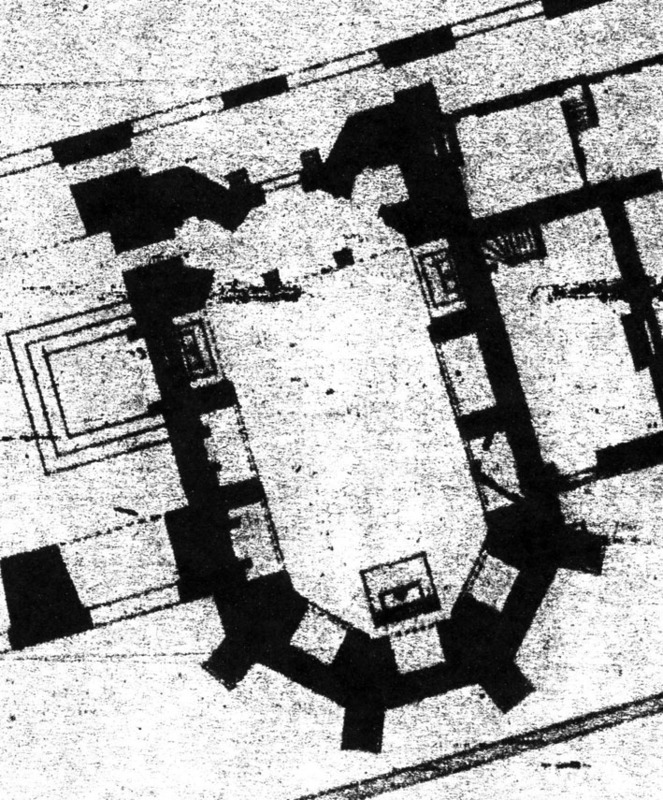 The plan of the building containing both chapels, oriented north-south, is about twenty-three meters long and thirteen wide (Fig.Morgan Plan, Ground Floor).9 The façade, now almost entirely concealed by the extension of the north wall of the Salle de Bal built early in the seventeenth century,10 is partially visible in Du Cerceau’s engraved view from the north (Fig.Du Cerceau, St. Saturnin). It has two towers of four levels rising one storey above the height of the façade. Between the towers is an arch at ground level, with a recessed doorway flanked by a column at each side (Fig.Morgan Plan, Ground Floor).1 The two levels above show single arched windows. In Du Cerceau’s view the towers have, it seems, open arches on their two upper levels. Only visible now are the top levels of the towers composed of six arches, the lower levels invisible behind the wall later built in front of the façade (Fig.St. Saturnin, Top Level).12 The two levels of the apse are composed of buttresses flanking round arched windows. Attached to the front ends of the buttresses on the lower level are piers set on high bases. The capitals of these piers have stags’ heads at the corners and the royal F on three sides interlaced with cords (of St. Francis’s habit, according to Castellan)13 on the sides and ribbons on the front; the salamander of Francis I is set behind the F on the front (Fig.Apse Capital, St. Saturnin; Fig.St. Saturnin Apse, Exterior; Fig.View of Apse, Exterior).14 On the level above is the same arrangement but the front of each pier has an engaged column with a capital composed of sirens like the capitals of the portico in the Cour Ovale.15 Beneath the center window is an oval plaque containing a salamander in relief; above the oval is a crown. The roof of the vault rises above the apse (on which see n. 23). The large central space of both chapels is about sixteen by seven meters.16 The Chapel of Saint Saturnin has four bays and an apse. The first or entrance bay17 and the second bay are covered by a single and somewhat flattened barrel vault that terminates in the groin vault of the third bay (Fig.St. Saturnin, Interior, Facing North). The fourth bay is also covered by a groin vault leading to the vaults of the apse. The vaults of the nave rest upon flattened arches that form three chapels extending from either side of the nave in the second, third, and fourth bays. The sides of the entrance bay are filled in below the level of the vault to support and buttress the towers. On the west side the second and third bays must have abutted the building to the west, on the ground floor of which a sacristy had been planned that would have had an entrance into the Chapel of Saint Saturnin. There are large windows divided by slender columns supporting small arches and round windows in the large arched areas above the flattened arches of the third and fourth bays and in the apse. The window in the third bay on the west set against the adjoining building would seem to have been blind (as are now also all the others on both sides of the nave because of the later structures that have been built against the chapel).18 The plan is reminiscent of the Basilica of Constantine in Rome but with somewhat flattened arches and vaults that resemble the central arches of the portico across from the façade of the church. The apse has three rectangular chapels set between the heavy piers that support the vaults. 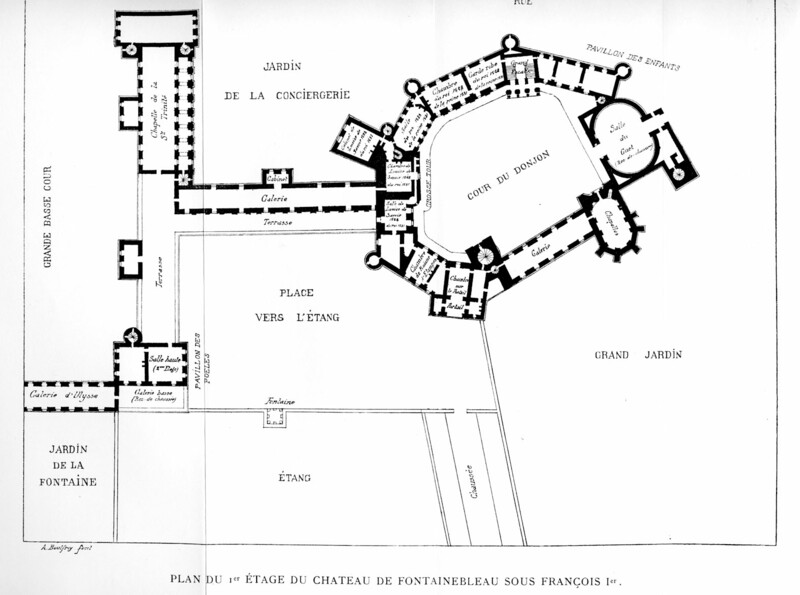 The plan of the Chapelle Haute is almost identical to that of the chapel below except that the entrance end has the same plan as the apse but with two chapels or sacristies and a central door instead of three chapels (Fig.Morgan Plan, First Floor).19 An entrance from the Small Gallery was probably in the second bay.20 The arches flanking the nave have the same flattened form as in the Chapel of Saint Saturnin, although they rise from slightly higher walls (Fig.Chapelle Haute). The arches create side chapels that may originally have had two windows each (see n. 23). The walls supporting the arches have been extended into the nave as piers to support the engaged columns of the level above. The same projections appear between the other rounded arches of the apse and entrance to form twelve around the entire chapel. The twelve engaged columns, which have themselves high bases and composite capitals, have round arched windows between them subdivided as in the lower chapel, the six facing the nave larger than the six at the ends. On the west one or two of the large windows would have been blind, as all are now (see n. 23). 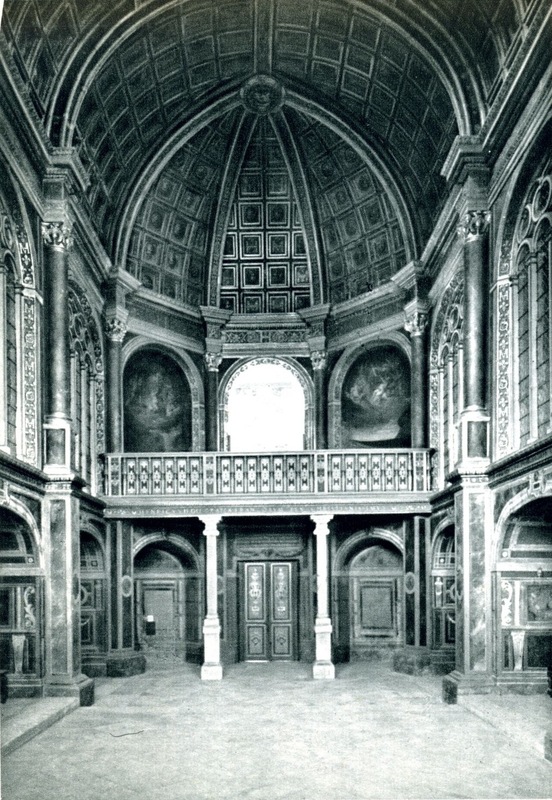 An architrave, frieze, and cornice encircle the entire chapel coming forward above each column (Fig.Chapelle Haute, Interior, Facing East; Fig.Chapelle Haute, Interior, Facing North). These support a ribbed and slightly pointed barrel vault and ribbed and, at the ends, slightly pointed groin vaults that come together at two medallions, one showing a salamander, the other inscribed: FRAN[CISCUS]. FRAN[CORUM]. REX, ANNO DOMINI M.D. XL.V. ABSOLVI CURAVIT.21 Dan gives the height of the chapel as six toises, or about twelve meters.22 This is in contrast to the considerably lower Chapel of Saint Saturnin. On the lantern and dome, which are probably not part of the original conception, see n. 23. Rosso could have been responsible for the designs of the chapels, and for the façade and bell towers that faced the Cour Ovale. Castellan’s descriptions and illustrations of the capitals in the Chapelle Haute lend support to the attribution to Rosso.27 Some of the figured capitals show the heads of old men with long beards, which suggest Rosso. Another group shows seraphim framing a chalice with the host. A third kind has winged cherubs holding a chalice with the host. 1 Mentioned by Dimier, 1900, 251. 3 On Pressouyre’s apparently false supposition that the resemblance may (partly?) go back only to 1748 when modifications to the portico would have been made, see A.2. 4 Prinz and Kecks, 1985, 426, 427, thought the Chapel of Saint Saturnin, the choir of which encloses the appended Upper Chapel, was by the same master who designed the portico in the Cour Ovale. But they brought up the name of Serlio, who was not in France when the portico was designed. 6 See Dan, 1642, 50-61, on this chapel and the Chapelle Haute. 7 Castellan, 1840, 76-83, as repeated in Gebelin, 1927, 102, n. 15, believed the exterior buttresses may have been strengthened to support the Upper Chapel. 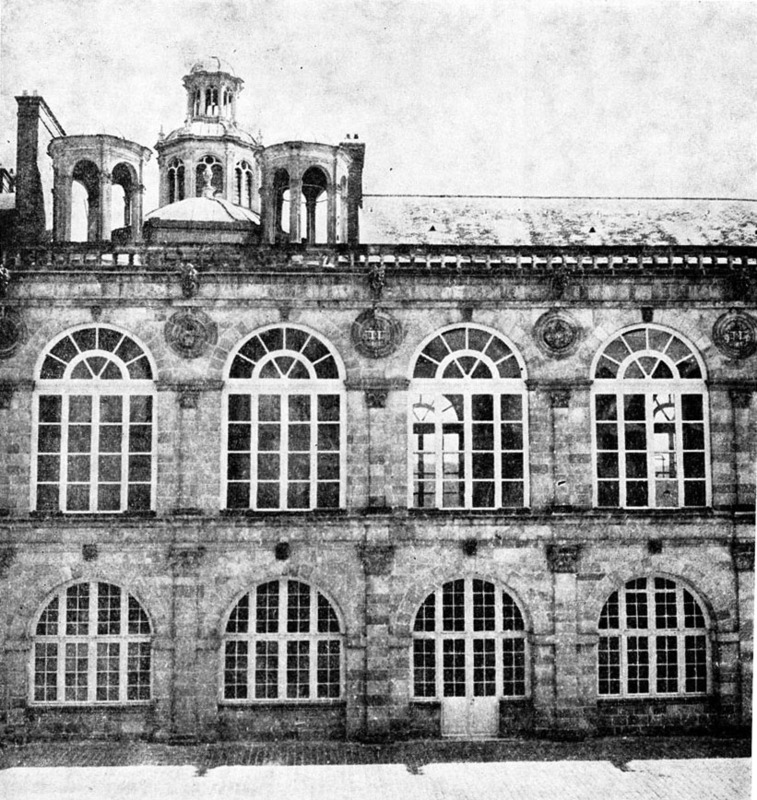 8 From the reconstruction of the plan of the château before the Salle de Bal was built in Dimier, 1900, following 240. 9 The dimensions are taken from the first floor plan, Pl. 17, of Morgan, 1956. The ground floor plan of Morgan, 1956, shows the later addition to the front of the building aligned to the north wall of the Salle de Bal (see below and n. 10). 10 See Pressouyre, 1974, 33, Fig. 4, 36-37. 11 See Morgan, 1956. Castellan, 1840, 77, recognized this door as that of the old chapel that he thought was on this site. 12 See Pressouyre, 1974, 33, Fig. 4, showing the upper level of the towers behind the wall later placed in front of the chapel (see above and n. 10). 14 See Pfnor and Champollion-Figeac, 1863, II, Pl. CXXXIX; see also 8-11, and Pls. CXXXVII-CXXXVIII, CL. 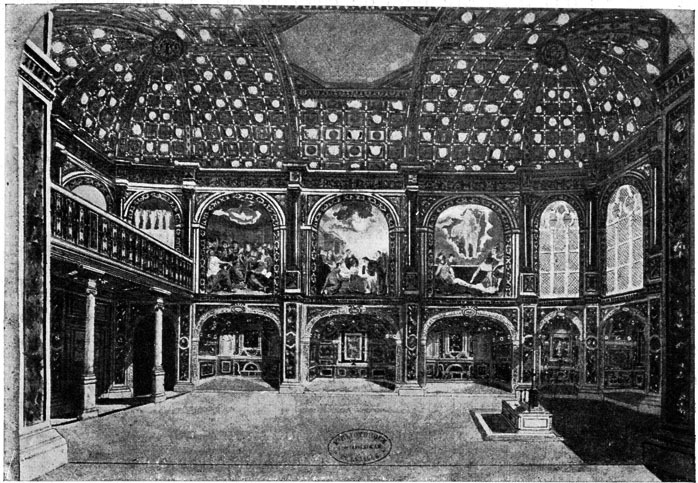 The chapel is also discussed in Pfnor, 1889, 135-144, with Fig. of one capital. See also Remard, 1820, 9, 33, 36-37. Blomfield, 1911, 51-52, and Pl. facing 50, commented on the remarkable capitals of the piers. His drawing seems to be of the capital at the far right. 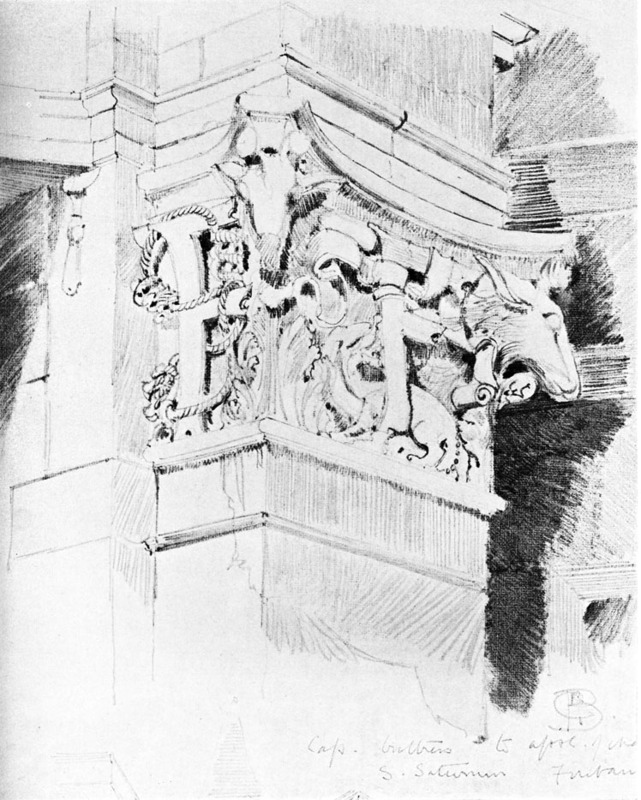 15 Similar fantastical capitals are found above the pilasters in the background of Rosso’s Narcissus drawing of 1531 or 1532 (D.44). 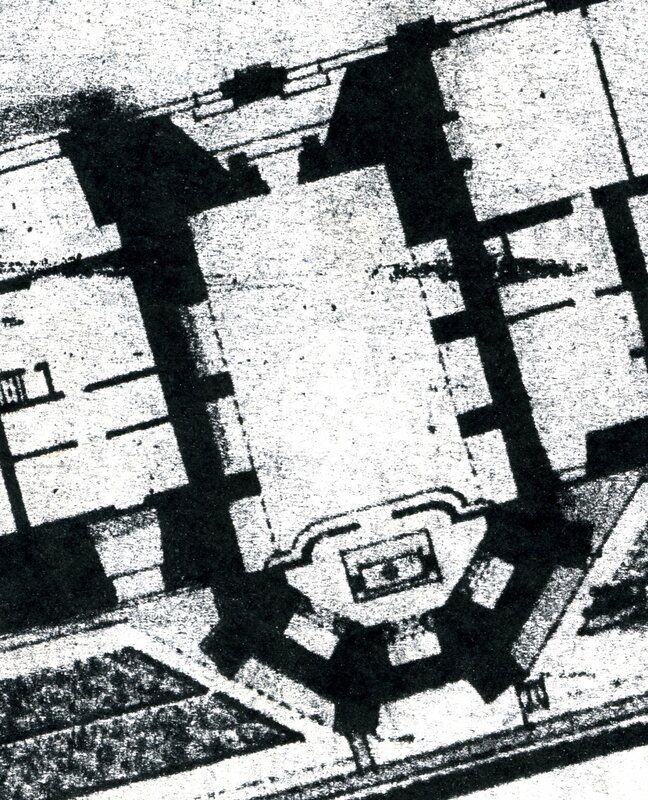 16 All measurements of the chapels are taken from the plans in Morgan, 1956. 17 For its decor of 1639, see Lossky, “Dessins,” 1971, 39, 40, Fig. 7. 18 See Pressouyre, “Cadre architectural,” 1972, 22, n. 8. 19 The entrance bay has now a tribune or gallery that was originally designed by De Lorme and built by Scibec de Carpi in the 1550s (see Roy, 1929, 239-240, 267-269). According to Blunt, 1958, 58, only the pair of Ionic columns remains of De Lorme’s project. 20 The existing entrance from the Salle de Bal is in the first bay but the Small Gallery probably did not extend this far north (see above and n. 8, and the plan of around 1835 in Lossky, “Dessins,” 1971, 39, 40, Fig. 6). 21 See Castellan, 1840, 82-83. The inscription is also in Palustre, I, 1879, 197, n. 1, as transcribed here. The vaults are now coffered, which may not have been part of the first design. 22 Dan, 1642, 58-59, gives the following dimensions of the Chapelle Haute in toises, which I have translated (approximately) into meters: the entire chapel, 18 meters long, 8 wide, and 6 high (the length and width slightly greater than on Morgan, 1931); the arcades at the sides, 3 meters long, 1.3 deep, and slightly less than 3 high; the lower piers, which he calls pilasters (and of which he counts only twelve), 3.5 meters; the engaged columns, architraves, friezes, and cornices, 5 meters. 23 Castellan, 1840, 78-79, thought this showed only the old chapel. But the view shows none of the Chapel of Saint Saturnin, which is hidden by the ground floor of the block at the west, and only a small part of the Chapelle Haute. There is visible one of the large windows of the nave and possibly part of a second farther to the north that is largely blocked by the Small Gallery. (There may also be two narrow arched windows below the fully visible large window, which would place them in one of the chapels under the large arches flanking the nave.) The roof is steeply pitched. This would seem to indicate that the octagonal domed lantern of the chapel is not part of its original plan but was added, probably when the Salle de Bal was built and all the windows on the west side along the nave were blocked by it. On the destruction and re-building of this lantern, and on the exterior appearance of the chapel in a drawing of 1831 by Viollet-le-Duc, see Lossky, “Cinq Dessins,” 1970, 186-187, Pl. XIX, Fig. 1. (See Pressouyre, “Cadre architectural,” 1972, 22, n. 8, on the insertion of blind windows under Henri IV.) Pressouyre, 1974, 31, said the chapel was completed in 1545 but did not say how she knew this; her evidence was probably the inscription on the vault medallion. 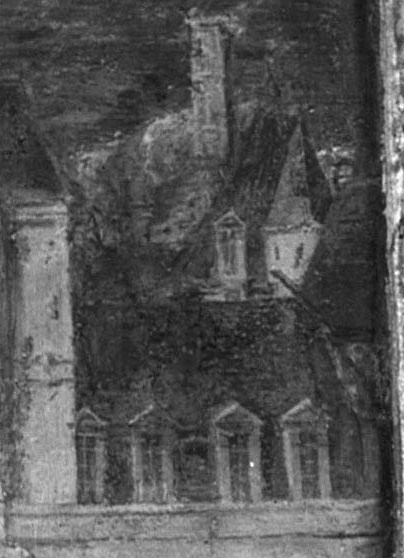 Du Cerceau’s views from the south, in which the lantern appears, show one nave window beyond the south side of the Salle de Bal but this is incorrect. Dan, 1642, 59, described the lantern and dome at length but did not say when they were built, commenting only that its exterior architecture matched that of the interior of the chapel. 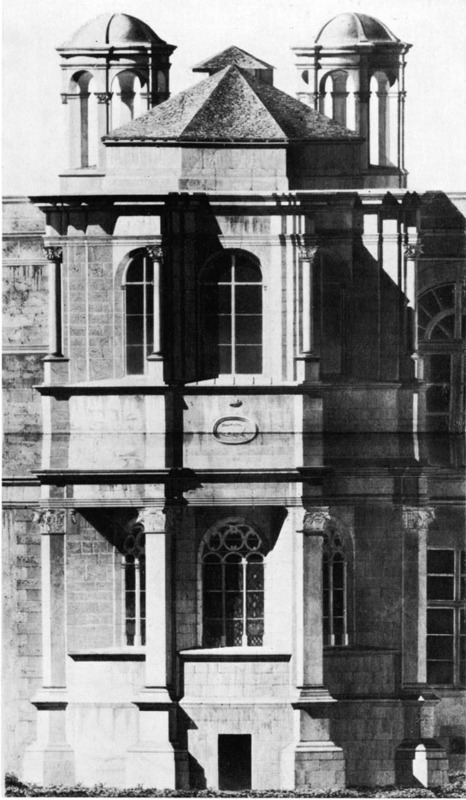 24 Castellan, 1840, 94, recorded that the chapel had been thought to have been designed by Serlio, an attribution accepted by Herbet, 1937, 233, 293, 294, 315-325. The earliest notice of Serlio in France is 17 December 1541 (see Gebelin, 1927, 103, n. 17). Babelon, 1989, 206, thought that the Chapel of Saint Saturnin may have been completed on Serlio’s plans in 1545. Vignola was brought to France by Primaticcio in 1541 to help in the casting of bronzes from moulds that had been made in Rome (Pressouyre, 1969, 224). At this time his career as an architect had not yet begun (see Blunt, 1973, 72). 25 See Roy, 1929, 239, 261; mentioned by Babelon, 1989, 421. The document mentions also the roofing of “deux lanternes de dessus lad. Chapelle.” This may refer to the open upper level of the towers, although it could also refer to the two octagonal lanterns, one on top of the other, that were built above the Chapelle Haute possibly when the Salle de Bal was built to replace the Small Gallery (see n. 23). De Lorme in his Architecture (see Dimier, 1900, 148) stated that rain got into the chapel due to its faulty construction. 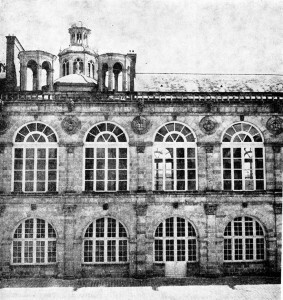 26 Castellan, 1840, 94, thought that the architect of the Chapelle Haute was De Lorme, and Roy, 1929, 239, thought that the architecture of the interior of the Chapelle Haute recalled very much the style of De Lorme. 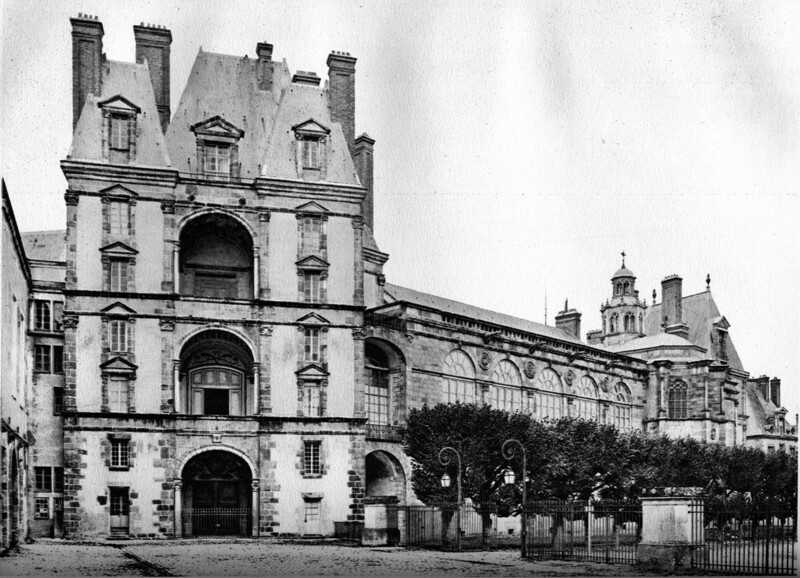 But De Lorme never mentioned it as his, and it would seem to have been almost entirely built by the time he became in charge of the architecture at Fontainebleau. On the decoration of the chapels, see Dimier, 1925, 44-45, 73-74, 88-89, with Figs. 27 Castellan, 1840, 96-97, Pls. 14 and 15. One capital shows the heads of a hind or stag with a garland of fruit between them held by the beak of an eagle, similar to what appears on the exterior. Castellan believed this was a replacement for a broken capital taken from the exterior decoration of the door when it was destroyed under Henri IV.